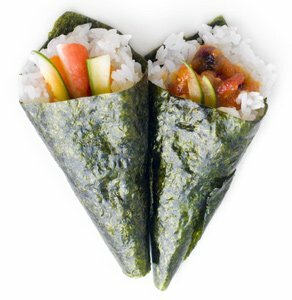 "Temaki sushi, also known as cone sushi or hand roll sushi, is a type of sushi that had developed outside of Japan by the influence of the western kitchen"
The temaki sushi is rolled by hand, so there is no need for a rolling mat, and its final shape is the cone, so there is no need for a knife either. Place the half-sized nori in your left hand, and use the right hand to cover half the nori with rice, about 1 centimeter high. Place a piece of fish and vegetable you desire on top of the rice, diagonally to the nori, as shown below. Keep holding the nori with your left hand, and use your right hand to bring the close nori corner on top of the fish and vegetable, and press it to close tightly. Keep rolling until only a tiny corner of nori is sticking out. Make sure you rolled it tightly, you can still make adjustments at this level. Keep rolling until only a tiny corner of nori is sticking out . Make sure you rolled it tightly, you can still make adjustments at this level. Step 4 – Wasabi time! In order to make the cone stick together, and for the sake of Japanese flavor, it is customary to put a tiny piece of wasabi on the end of the nori just before you close the cone. You can do without it, but why would you? Interesting! Temaki sushi is may favorite. I’ve decided to learn how to make it myself. This is my first research and I landed here. A good start for me I think. The guide seems to be simple. I’m going to try and see the outcome. Thanks for the great but simple guide.